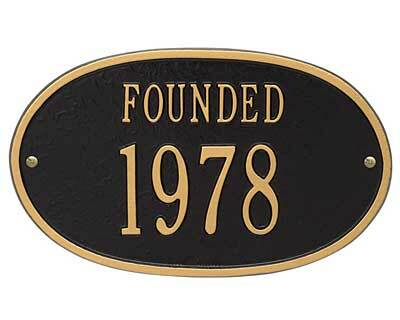 Highlight the year your family or business began with this Whitehall Standard Date "Founded" Wall Plaque. The classic, oval shape adds a timeless look to this marker, and the raised border and customization capture attention. The word "FOUNDED" in all caps rests at the top of the sign, and the bottom line accommodates up to four 3" tall numerals for displaying the year. This allows you to showcase your business history perfectly. Each plaque is crafted from aluminum using a sand mold made to order, for a sturdy and one-of-a-kind piece. Predrilled holes and included screws make it simple to mount the sign to a wall, and the hardy construction withstands exposure to the elements. Add a memorable accent to your home or office wall using this Standard Date "Founded" Wall Plaque. Hand cast from recycled aluminum in the USA. A black plaque with gold numerals is pictured using the color code "BG". Note: This address plaque may contain numerals only. Line 1: Holds up to four 3" numerals.